For much of the US hammock tent camping is fantastic & arguably the best way to sleep in the backcountry. This is true anywhere with trees—nearly all of the eastern US & much of the Mountain West. 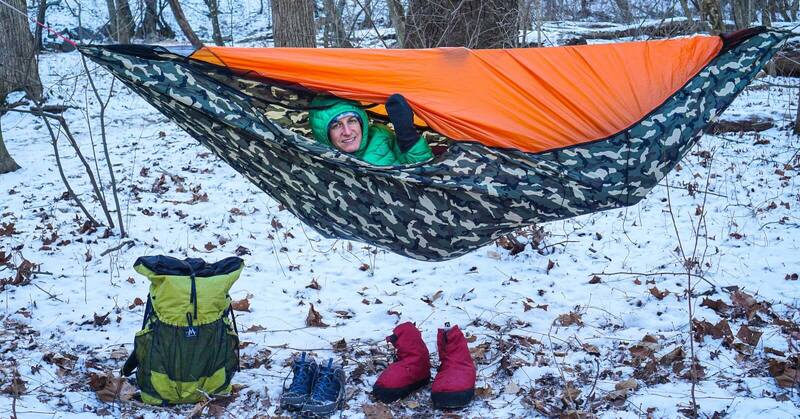 One hammock can do it all—and well! The Chameleon, works in all conditions from hot, bug infested jungles to bitter cold winters of the Northeastern US. In the following “Review of Dutchware Chameleon Hammock,” I discuss what makes it possibly the best multi-season hammock. 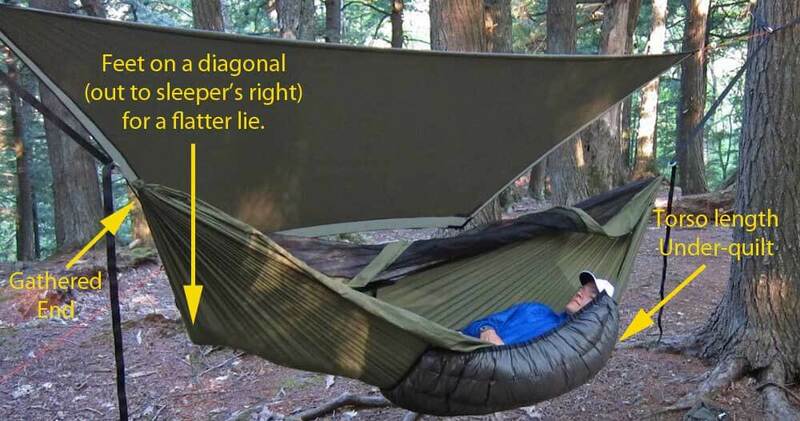 The review concludes with a Comparison of the Chameleon Hammock to its nearest Competitors. Over the past few months my wife and I tested a near-production model of the new Dutchware Chameleon Hammock (currently on Kickstarter) in a wide range of environmental conditions: from the hot buggy, disease infested tropical jungles of South america to camping in the snow at 15° F in the Mid-Atlantic winter. For those of you unfamiliar with hammock camping, know that it is our preferred method of camping in areas like the Appalachian Trail. 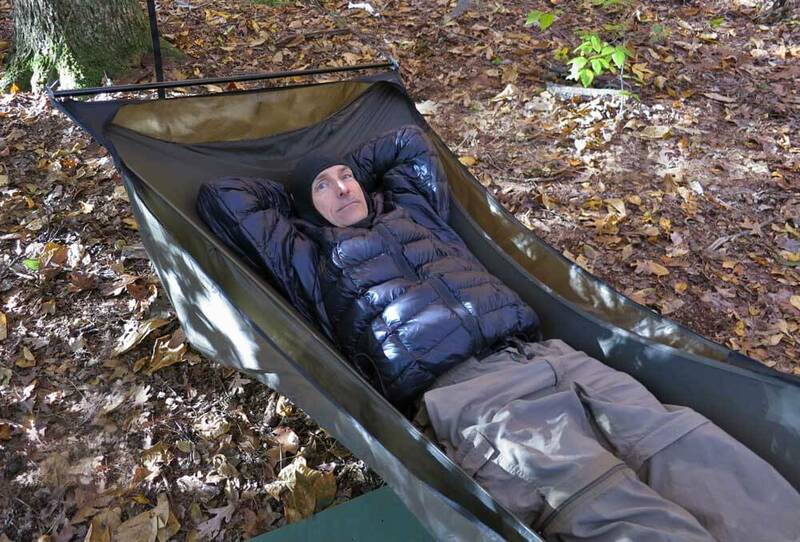 See more on “Why hammocks are best for the East Coast and other wooded areas.” And more on this in our 9 Pound Lightweight Backpacking Gear List. The modularity/versatility of the hammock. 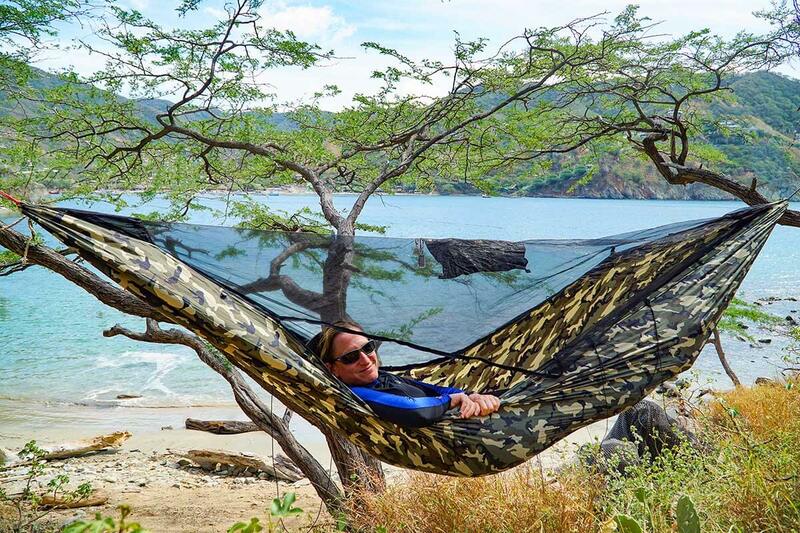 The Dutchware Chameleon Hammock works in almost all environmental conditions by easily mixing and matching components. All without a weight or functional penalty. New (patent pending), 2-way separating zipper that opens in the middle on both sides in any location. This innovative zipper is the key to the Chameleon’s modularity and versatility. Low wait times (less than a week?) for a custom made hammock to your spec. with your choice of fabric weights, colors, widths, covers, parts etc. Oh, and it is very light. My version of this hammock is a smidge over a pound (17.5 oz) including suspension! New buckle suspension system with an optional spreader bar for hanging hammocks side-by-side from the same tree. To adapt in different environmental conditions, all of these parts can be purchased individually, or in any combination. If you purchase additional components later, they will fit perfectly with your current components. Even if you buy a wider hammock body it will still mate with your original top covers! Dutchware might also be called “House o’ Outdoor Fabrics,” for their huge selection of colors and weights — all high quality fabrics. Almost all of these fabrics can be selected in any combination for both the body and the solid top cover of your Chameleon. You can buy a Chameleon with a netting top cover in the spring. And in the fall purchase a vented solid cover for the colder weather of late fall and winter. In my case, I have one bright orange solid cover for fun when camping with my wife, and another camo cover for stealth camping by myself (it mates to my camo hammock body). 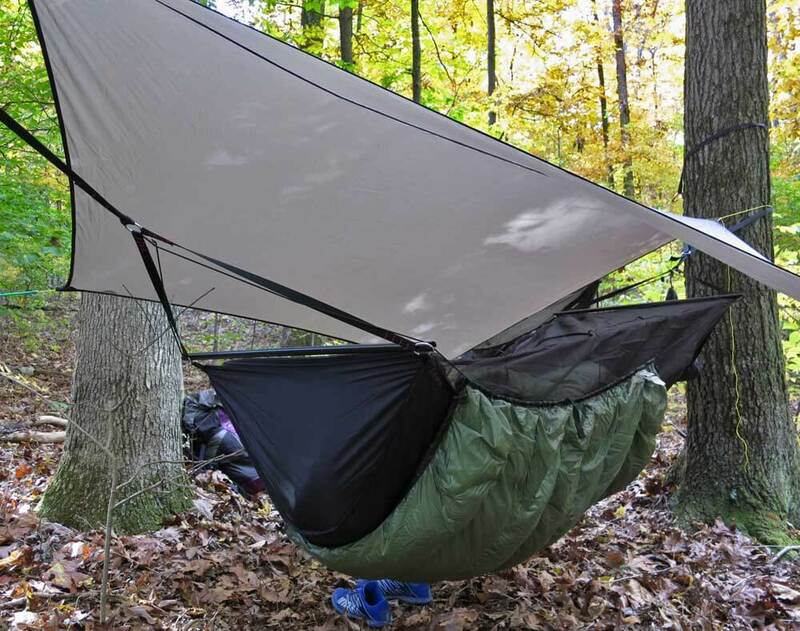 Finally, you can use the hammock without a top cover, my favorite option for most spring and fall camping in the Mid Atlantic! Solid Top Covers are Great in Cold Weather! Most people are familiar with mosquito netting hammock covers for bug protection. But many are less familiar with the reasons/advantages of using a solid top cover in winter. 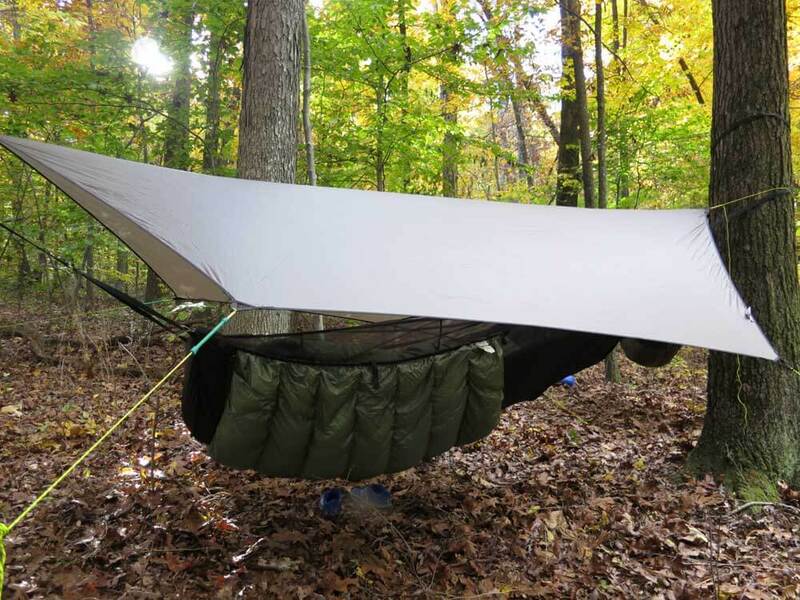 The solid top cover retains heat and BLOCKS WIND, essentially turning the hammock into a winter bivy sack with a face vent. 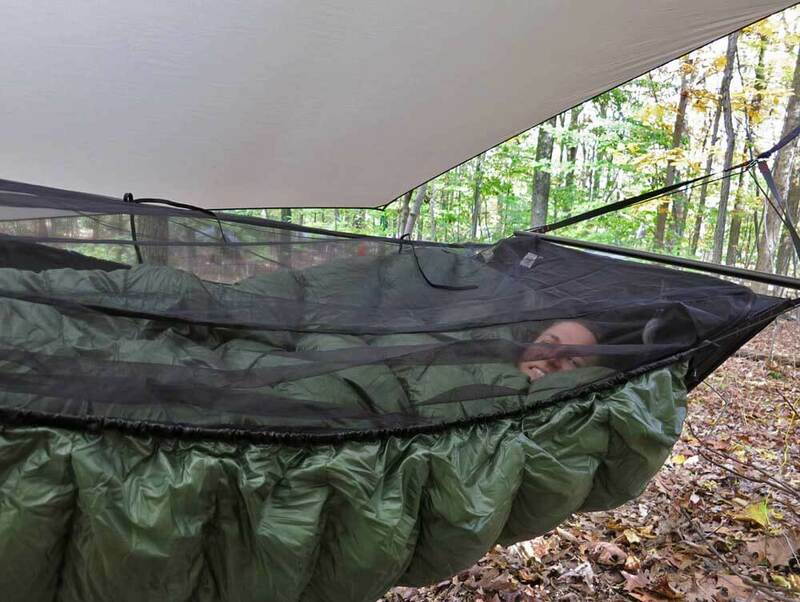 This retains your body heat in a sheltered envelope formed by the hammock body and top cover combination. The top cuts down on convective (wind driven) heat loss. But the mesh vent, located where you breathe out humid air, also vents excess moisture that might condense inside the hammock and get your down quilt wet. Finally the top cover is itself breathable, also reducing condensation in cold weather. I can get out of whatever side of the hammock I want. It opens on both sides (and at the same time) and in any position along either side. I can slide my hands down either side of the hammock at night to check-on/adjust my under-quilt. Finally, this zipper allows me to flip the top cover to change the lay of the hammock. This is nice when my wife and are hammock camping side by side and want to coordinate lays. *Virtually all zippers on backpacking gear are coil zippers. 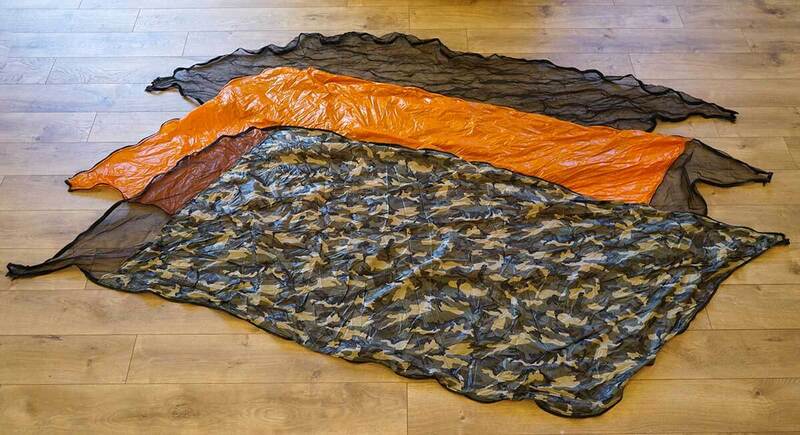 If you try and mate coil zippers, for example, to zip together two identical sleeping bags, they won’t mesh well. As you zip, you’ll get a bit of warping and strangeness. This is because the coiled zippers come in matched pairs, and were never intended to be mated with other zippers, even if they are exactly the same type. It often seems like you have to pick your poison with backpacking gear. You can custom order the exact gear you want from a cottage manufacturer but then wait 4-8 weeks for it to be made and delivered. You can pick an off the shelf item (usually some compromise/deviation from your ideal choice) and get it in around a week. There are other manufactures of similar hammocks. Some of these hammocks also have an interchangeable mesh and solid covers. But before I start comparing I want to be very clear that all the hammocks below are great hammocks with established performance and dependability. You would not go wrong buying from any of the three companies below. I own and like hammocks from all three companies. I know Brandon Waddy of Warbonnet and Tom Hennessy. They both produce excellent hammocks that have widespread use and great reputations. And Tom is rightfully considered the man responsible for modern asymmetrical backpacking hammocks as we know them (and has the patents to prove it). Hennessy Hammocks Hammock includes rainfly. Available off the shelf from retailers like REI. No solid top cover option. Integrated bug net cover only opens on one side. Bug net not removeable. No color choice. Warbonnet Blackbird XLC Solid top cover option. Integrated “storage shelf” on one side, and “extended footbox” on the other. 1 week wait. Single zipper only opens in only one location. RH lay only. Limited color choices. Dream Hammock Sparrow Zipper opens on both sides of the hammock (but only in center). Solid top cover option. Many fabrics and colors. 4 week or longer delivery time. None of the other hammocks offer a 2-way, separating, toothed zipper that both rotates and flips 180 degrees, mates perfectly with other zippers and opens anywhere on both sides. This is what allows fully interchangeable components, allows you to open the zipper on both sides in any location, and to change from Right Hand to Left Hand lay in the field, in just a few minutes. The Dream hammock Sparrow comes closest to the Chameleon with a coil zipper system that opens on both sides of the hammock, but only in the middle. Actually it has four zippers (two on each side that meet in the middle). This is an excellent Method to Manage Hammock Tarp Doors. It’s fast and simple to use. It keeps the tarp doors neatly and securely out of the way in dry weather or when you are getting in and out of the hammock. But it quickly secures the tarp doors if needed—like when a rain storm quickly moves in. This is a great do-it-yourself DIY project—instructions are below. You need to appropriately alternate male and female clips ends. Clips need to correctly mate in both open-and-stowed position (Picture 1), & in the closed position (Picture 3 & Picture 5) . Use about 3 ft. of shock cord attached to each clip. This is a starting point as tarps are different. 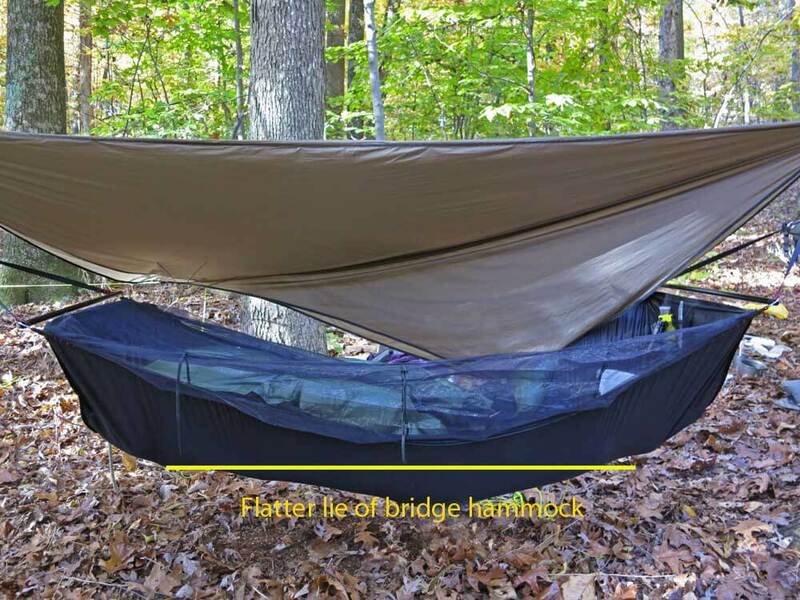 A 9 ounce hammock: This Gear List suggests using a hammock, which on the AT has significant comfort and performance advantages vs. a tent. This gear list is fine tuned to the climate and terrain of the Appalachian trail rather than the more generic 9 Pound – Full Comfort – Lightweight Backpacking Gear List which is intended to cover most of the lower 48. For instance, the AT Gear List suggests using a hammock vs. a tent, since trees are plentiful along the AT, whereas flat, rock-free places to setup a tent and sleep on the ground are scarce. For more on hammocks see: Hammock Camping Series – Part 1 – Advantages of Hammock Camping. If you aren’t interested in hammock camping, the list also includes and alternative options for traditional (ground) camping. Since most folks will be sleeping in AT shelters it doesn’t make much sense to carry a tent, which will go unused most nights. To save weight, just carry a light tarp in the low probability that there is both no room in the shelter and that it will rain. For more conventional tent & sleeping bag options see: 9 Pound – Full Comfort – Gear List. This gear list is suitable for most backpackers on most 3-season trips (possibly 3+ season) along the Appalachian Trail (In some instances, you may wish to fine-tune this list to your particular trip needs and/or backpacking style by selecting suitable optional or alternate gear in this list.) I’ve also tried to list a number or items available from major retailers like REI, e.g. the excellent and reasonably priced Outdoor Research Helium II Rain Jacket at only 6.4 ounces! Clothing in Pack (not usually worn) 2.3 Rain jacket, warm jacket, gloves, etc. (alternate to hammock camping) 3.3 Since most folks will be sleeping in AT shelters it doesn’t make much sense to carry a tent, which will go unused most nights. Clothing Worn and Items Carried (not in pack) 4.3 Not included in pack weight: clothing worn on the trail, hat, shoes, trekking poles, stuff in pockets, etc. Warm jacket West. Mtn. Hooded Flash Jacket 10.5 Warmth Important for rest stops and in camp. Warm hat Mtn Hdw Power Stretch Balaclava 1.2 Warmer than hat – great for quilt w/o hood! Liner gloves DuraGlove ET Charcoal Wool (2.5) Great liner glove – light, warm, durable! Rain Mitts ZPacks Challenger Rain Mitts (1.0) 1.0 For intermittent use. Expensive. Rain Mitts (alt) MLD eVENT Rain Mitts (1.2) 1.2 For intermittent use. Pack (alt) Gossamer Gear Gorilla 40 (26 oz) Has frame. Durable. Right volume for AT. Record setting pack. (for conventional ground sleeping options see “Alternate Camping with a Tarp” below. (with Hexon 1.0 fabric ) 12.5 Light, all essential features & bug protection. Value! Since most folks will be sleeping in AT shelters it doesn’t make much sense to carry a tent, which will go unused most nights. To save weight, just carry a light tarp in the low probability that there is both no room in the shelter and that it will rain. For more conventional tent & sleeping bag options see: 9 Pound – Full Comfort – Gear List. Sleeping Pad T-Rest NeoAir X-lite “Women’s” 12.1 Perfect size for most. Warm. Super comfortable! Tent/Shelter (alternate) MLD Grace Duo Tarp Silnylon (15) Cuben (7.8) 15.0 Pers fave for many trips: Huge coverage. Low weight. Great ventilation and views. Cookset Trail Designs Toaks 900ml Pot, Sidewinder Ti-Tri, 4fl-oz fuel bottle 5.3 Lightest, most practical cookset on the market. Zelph StarLyte Burner stores unburned fuel. Cookset (alt) Jetboil Zip Cooking System, Jetpower 100 Fuel Canister (18.5) EZ to use. Much heavier than the alcohol stove cookset. Not “green” with non-recyclable canisters. Sawyer Maxi-DEET Spray (0.5) Convenient size; effective. Sawyer preferred. Pants Rail Riders X-Treme Adventure (16) Pers fave. Very durable, no velcro on pockets! Pants (alt) REI Sahara convertable pants (14) 14.0 On trail, in shade: will hike in shorts most days. Bra Lighter, quick drying spots bra Not an expert on this one! In addition, I’ve listed key hammock manufactures and purchasing resources below. I own and like hammocks from all these companies. I know all their owners personally. They produce excellent hammocks that have widespread use and good reputations. Most also offer all the hammock accessories you might need, top quilts, under-quilts, tarps etc. Give them a call if you have questions on how to equip or comment below and I’ll try and answer. Hennessy Hyperlight Asym Zip 22 Tom Hennessy is considered the man responsible for modern backpacking hammocks as we know them & has the patents to prove it. This is their lightest hammock & available at REI. AntiGravity-Gear Quicksilver UL 10.4 Another inexpensive, light, no nonsense, netless hammock that comes with a very light suspension system. Hammock Gear All hammock accessories n/a Great supplier of everything else you need for hammocks. Top quilts, under-quilts, tarps etc. Some very light gear and some great values including their $150 Econ +20F down quilt. * Weights are approximate, and unless noted include MFR’s suspension (cord to hang hammock and wide tree straps to protect trees—important for LNT!). Dutchware Chameleon and Netless hammocks weights are with my own Kevlar tree straps. † approx. 24 oz if you can use your trekking poles as the spreader bars. 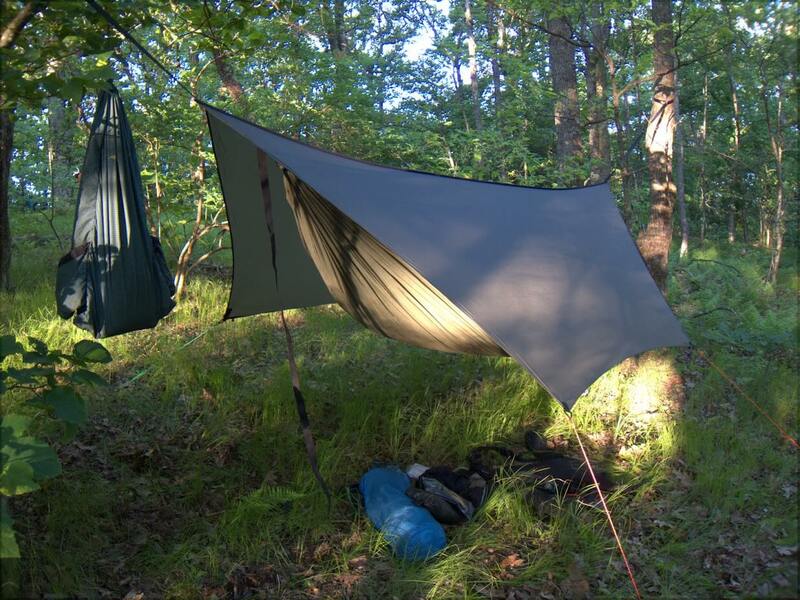 Types of Backpacking Hammocks: is the second part of this three part series. It has an asymmetric shape (i.e. not symmetric) that allows the sleeper to lay diagonally to its center-line, which is a flatter sleeping position than the banana-shape of the center-line. 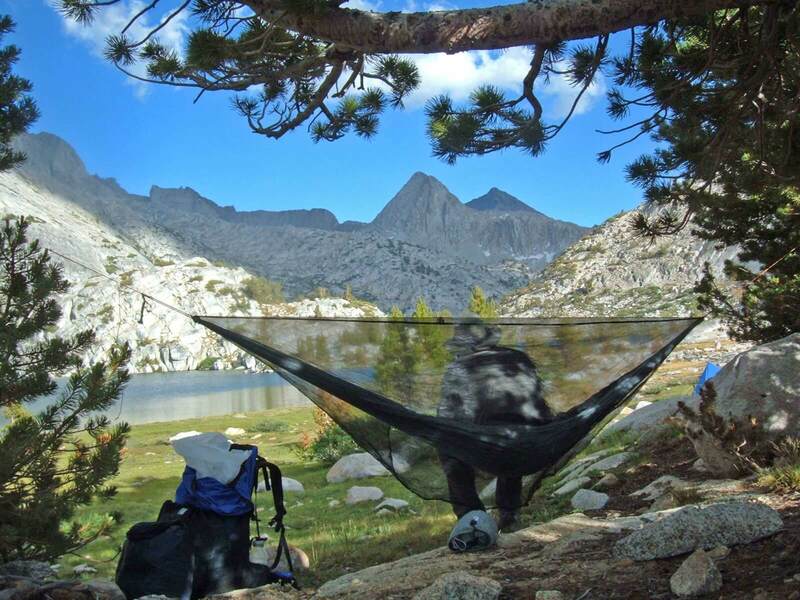 A gathered end hammock made by George “Tin Man” Andrews (self-portrait), being used as a camp chair during a thru-hike of the John Muir Trail in California. The spreader bars add weight to the system; however, most designs allow trekking poles to be used as substitutes. Some sleepers may find that its tubular shape is more constrictive. 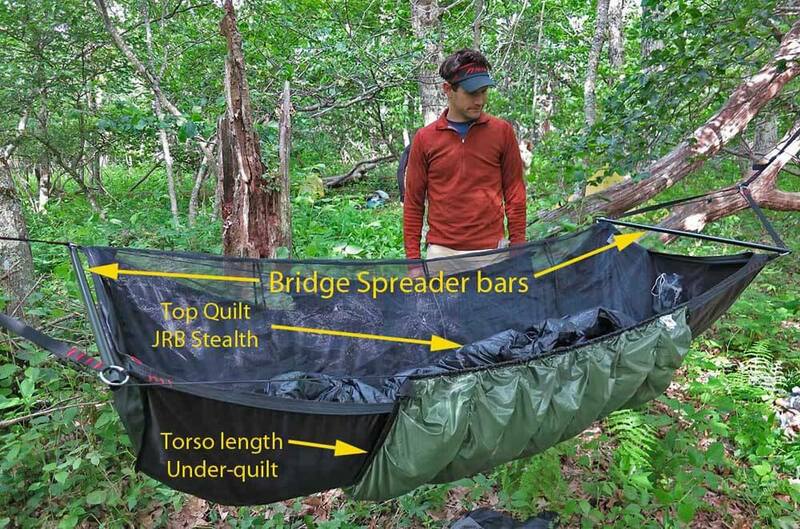 Andrew Skurka inspects a classic bridge hammock: the Jacks R Better Bear Mountain Bridge with Greylock 3 under-quilt. Bridge hammocks create a “flatter” lie than gathered end hammocks. Note that flatter does not mean absolutely flat. Most sleepers find it more comfortable to have their head slightly lower than their feet. To insulate themselves against the ground, which will steal heat from a ground sleeper through conduction, ground sleepers use closed-cell foam pads or air mattresses. 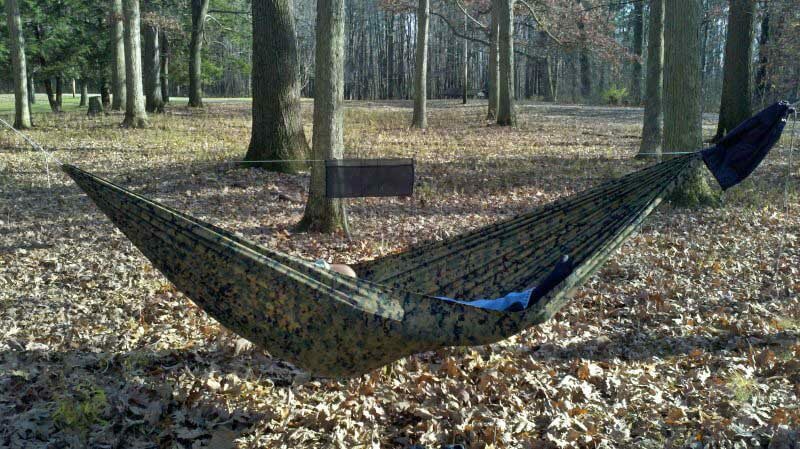 Hammock sleepers can also lose heat from their underside, but due to air convention, especially if there is a wind. There are two options for reducing this heat loss: 1. 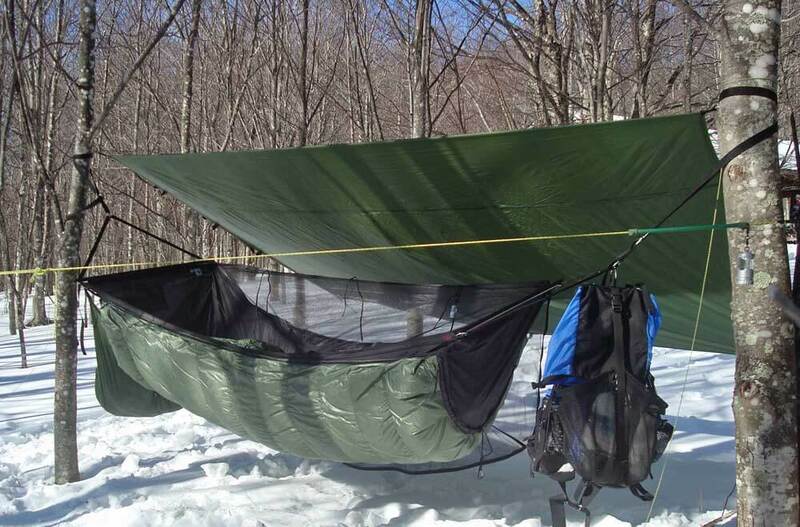 Use a double-layer hammock to capture and control the ground-pad. The pad is inserted between the two layers of fabric. This extra layer of fabric adds weight, but it will securely fix the ground pad in place. Double-layer hammocks are popular for this reason. 2. Use an under-quilt. A better solution is to use a hammock-specific under-quilt, which increases the warmth and comfort of a hammock. It also increases the weight and expense of a hammock system, but by no more than would a NeoAir mattresses from Therm-a-Rest, which are extraordinarily popular with ground sleepers. As an added perk, you will not get dizzy inflating an under-quilt. A good top and bottom quilt make all the difference for a warm night’s sleep. Pictured above is my wife, Alison, cocooned in down — a Jacks R Better High Sierra Sniveller top quilt and Greylock 3 under-quilt. How much does a hammock system weigh and cost? And how does the weight and expense compare to conventional ground systems? As explained in Part I of this 3-part hammock series, it’s very difficult to compare hammocks and ground systems. Each system has several popular designs and an almost infinite number of configurations; there is no “standard.” Moreover, it’d be a challenge to find two systems that offer the exact same features and user experience. Nevertheless, I have tried, below. Each system offers a standard level of protection against rain, ground water, wind, and bugs. Each system also includes underside insulation, through either an under-quilt or a sleeping pad. Topside insulation (i.e. sleeping quilt) was not included into the weight or expense of these systems because this component would not change across systems. 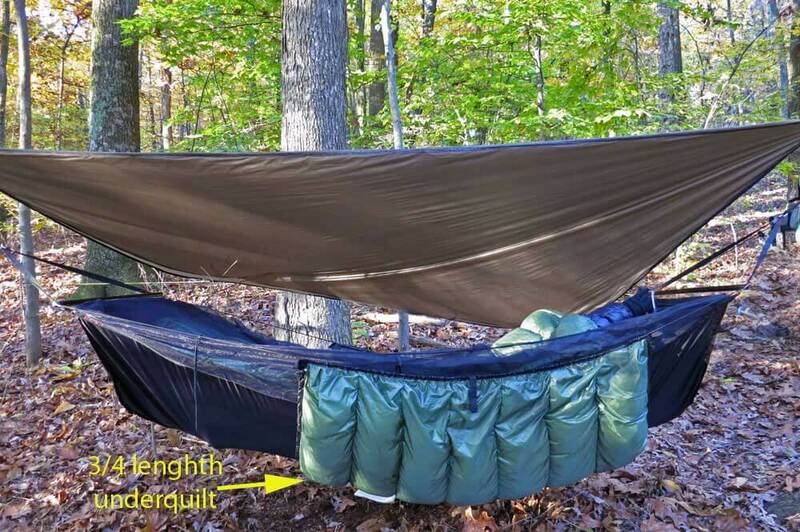 The conclusion you should reach is that hammock systems weigh and cost about the same as “comparable” ground systems. 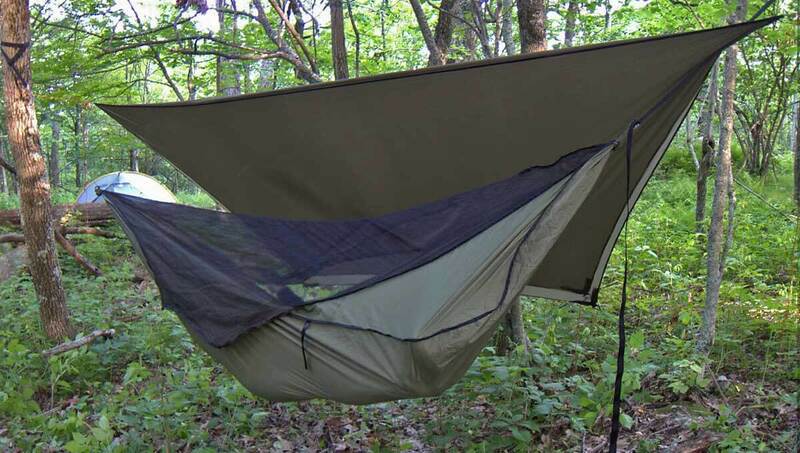 Other considerations—such as where you normally backpack, whether you want a one-person or multi-person shelter, if you have already invested in gear that is optimal for one system or the other, and if you are struggling to sleep well with your current system—will drive decisions about whether you are better off with a hammock or ground system.